In order to understand the operation of this pneumatic circuit, you should know working principles of five port four-way air-to-air valve. You can watch that video by clicking the link shown here, before proceeding with this video. There are many application of five port, four-way air-to-air valves. One of them is building a pneumatic reciprocating circuit. Even for that application, there is more than one solution to the same problem. Of course, advancement in cheap electronic controllers such as Arduino or PLC controller made this kind circuit obsolete. However, making an animation of old solutions makes it easier for the people to understand the pneumatic concepts. Especially if they don’t have any expertise in PLC or Arduino programming. Here a four port four-way rotary directional valve controls the pilot ports of five port, four-way air to air valve. The spool of this valve has four grooves ninety degrees apart. There are two holes connecting two grooves on the opposite site of the spool. These two holes are at different depth, so they do not have any connection to each other. This rotary valve can be considered as four port four-way valve and its symbol is shown in here. Pressure port is labeled as P, while the exhaust port is labeled as R. A and B ports are connected to the pilot port of five port, four-way air-to-air valve. 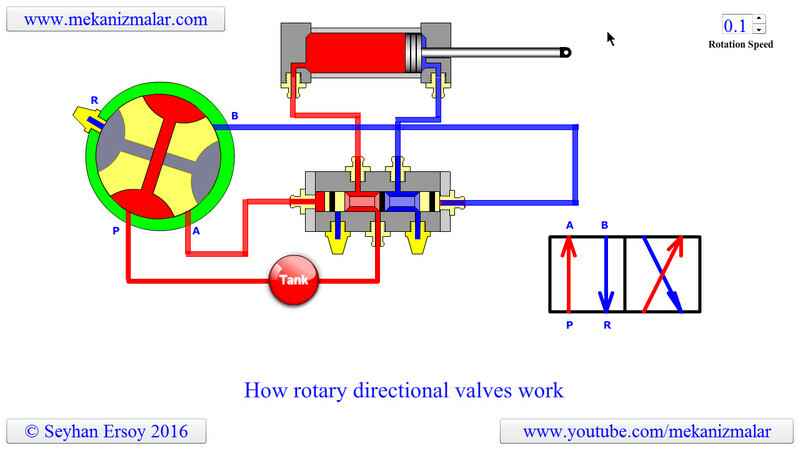 By rotating the spool of the rotary valve air can send A and B ports of the rotary valve alternately to cause reciprocation motion. Increasing the rotation speed of the rotary valve will cause the piston reciprocate much faster. If we increase the rotation speed of the spool of the rotary valve, the piston may not keep up with this pace of rotation. We may attach quick exhaust valves to cylinder ports to release pressurized air in the cylinder much faster. However, after certain rotation speed, whatever we do, the piston will not complete its full reciprocations. One has to choose most appropriate cylinder size for given reciprocation speed. Smaller the cylinder higher will be its reciprocation speed.